While a horse racing program often lacks any kind of context for the statistics and information it provides, it does provide a lot of raw data to run with. A horse racing program doesn’t analyze or compare, but it gives you straightforward names, numbers, and facts. Below, we’ll outline all the constituent parts included in a horse racing betting program. Understanding how to read a horse racing program is integral to being successful when you’re betting on horses. What Is a Horse Racing Program Trying to Illustrate? Think of the racing program as providing the same kind of information that a baseball card does. A horse racing betting program offers you a condensed biography of each horse running in every race taking place on a given day, the particular track the horse is racing on, and a description of what sort of races are scheduled. The first thing you will find on each page of the program is what sort of event is taking place. This usually means what type of horse race is going to be taking place. Race one, for example, might be for three-year-old males that are eligible to be claimed (purchased) for $25,000. The types of betting options available to you, the distance of the race, the surface (dirt or turf), and the purse will all be noted in a horse racing betting program. 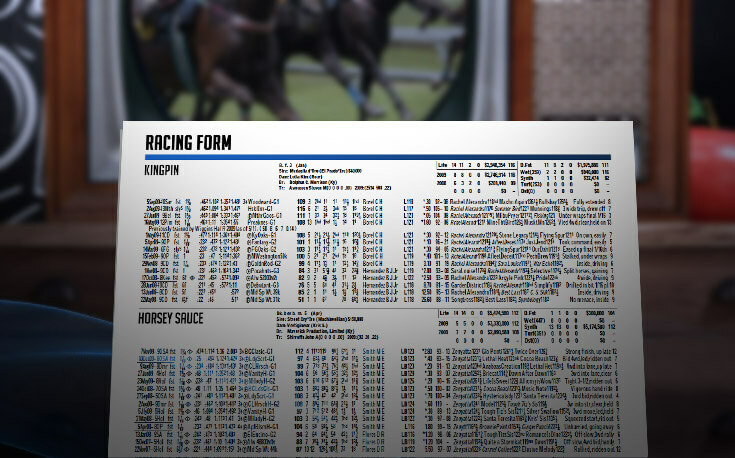 On a horse racing betting program, each horse will have a few rows that provide information about him or her. The program will list each horse in order of their post position. The number one position will break from closest to the rail (on the extreme inside), number two just outside number one, and so forth. For each entry, in addition to its post position, the program will have the horses name, his jockey, trainer, owner, and breeder. It will tell you the horse’s age, and their parents’ names. The program will list how many races the horse has run in, both in their life, this year, and last year, on various surfaces, at the track they are running at today, and how many times among those races they have finished first, second, and third. It will also list the horse’s earnings in each of those categories. The morning line, an estimate provided by an expert at the track on what the horses odds will be when the race begins based on their credentials compared with the other entrants, will be present too. This information isn’t likely to be of consideration to beginner bettors, but it’s something that more experienced, sharp bettors factor into their bets. In the same way that sports teams practice in addition to playing games, horses don’t just run on race day. Workouts are designed by trainers to test a horse out at various distances, or on different surfaces, or simply to maintain conditioning. Since workout reports are accessible, in the Daily Racing Form and elsewhere, knowing the ways that they get described is worthwhile. Understanding horse racing workouts is imperative, as you’ll need to know what kind of shape a horse is on before you lay a wager at either the track or your sportsbook on the day of the race. A horse that is breezing is having a strong workout. He is running well without being prodded by his rider to do more. He is running well without the need for encouragement. If a horse engages in a workout that is pretty strenuous but the rider does not need to use his whip to encourage the horse it is considered handily. This is a strong workout. The horse is being tested and responds well. The Daily Racing Form is sometimes referred to as the horse bettor’s bible. It includes everything essential to determining which horse you want to bet on. The form has all of the same information as a horse racing program, but it incorporates a deeper level of analysis and more comprehensive details. Below, we’ll touch on what makes the horse racing betting form such a powerful tool. Past performances are essential for handicappers to decide who to bet on. They’re a detailed account of each of the last 10 or more races that a horse has run in with the ensuing results. For beginners, concentrate on any basic trends you can find. If a horse seems to have consistently good results at a particular track or if a horse fares well running at a certain distance, factor this knowledge into your bets. Whether it be the Beyer Speed Figures in the Racing Form or something similar in another publication, a figure will help determine which horse had a better performance. Using historical data, speed figures can tell you how a win at a longer distance at a smaller track on a fast surface compares to a third-place finish in a sprint at a top venue on a rainy day. Speed figures are an excellent starting point for handicapping. They provide a good gauge on who the top contenders are and, comparatively, which horses don’t quite measure up. They can also be a good way to break a tie between two horses you are considering or to recognize how one race might be very competitive but another seems straightforward. They also can help assess value. A horse with good speed figures that isn’t receiving a ton of betting volume (and hence has longer, betting odds) could be worth wagering on. Conversely, a popular horse with poor speed figures may be overhyped, and thus worth staying away from or betting against. Speed figures are unbiased and easy to compare. If you are going to make a bet without spending a lot of time considering your options, the quickest way to do so is by glancing at the figures and choosing a horse that is producing comparably high numbers in similar races. The form will write a few sentences on each horse running at most tracks. If you are primarily handicapping using numbers and data, it can be easy to miss something. This is where the analysis portion of daily horse racing betting forms comes in handy, producing a digestible snippet for bettors on the go. Keep Learning About Horse Racing Today! There’s a lot to sink your teeth into with horse racing, but there’s a wide variety of other sports to get into as well. Still after more wagering insights? Learn how to bet on more sports today!